After more than ten years, Crom Dubh's first LP has been long in the making, but after giving this one a listen, I'm thinking it was clearly worth the wait. It's a wonderful thing when a black metal band can provide a nice trade-off between a raw sound and melody, and Heimweh nails this, coupling the pretty melodies and black metal stylings with some monster riffs that make the whole thing larger than life. Heimweh has some things vaguely in common with fellow UK bands Fen or Saor, but where those two are gentler and more sorrowful, the Crom Dubh sound feels much heavier and more menacing. The production is good, and the resulting tone feels big and portentious; Cutting Teeth II loses no time in loading the listener up with melodic riffs that are often major-key, like a movie soundtrack, and having two guitarists seems to make their riff-making more flexible, somehow more organic than a one-man show might. After all the speed of Cutting Teeth II, The Invulnerable Tide starts slowly, but the way they've got drummer A. Haege hammering the kit, even the slow parts sound like they belong on a soundtrack to one of the battles in "Braveheart", and the melody seeps into this song too. There's an epic grandeur imparted to the melodies by the midrange lead guitar they have going that is lent harshness by the vocals; the singing isn't especially tormented, but it's quite rough, for M. Beonetleah and S. O'Fairdehaigh refuse to let a single clean "ooh" or "ahh" pass their lips. I especially liked Kings II, a steady piece with some intricate two-guitar tremolo picking trading off with one another, but after the title track, which ends on an absolutely heroic note, we get Sailing to Byzantium, the most aggressive song on the album. In contrast with a lot of the major-key tunes preceding it, it has a harsh, bleak sound to it, with the riffs and vocals reminding me a bit of an Immortal song -- not as raw as that, but certainly in the song structure. This is one of the best albums I've heard this year so far. 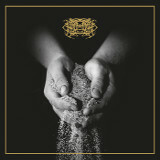 Crom Dubh cleverly fits melodies over a tough, abrasive skeleton of black metal and the result is a high-quality album that ends up being far more on the epic side of things than many of their UK black metal contemporaries, making it an album I wholeheartedly recommend checking out.